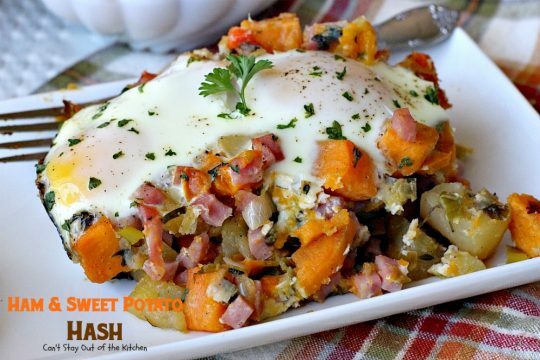 Oh my goodness, I hit the gold mine with Ham and Sweet Potato Hash! 🙂 No kidding. I absolutely LOVED this great breakfast recipe. 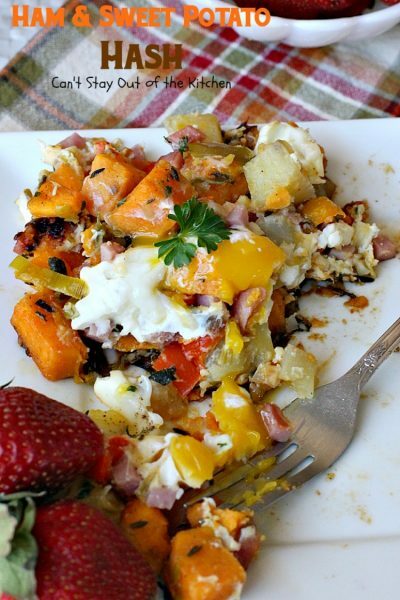 I started with a batch of my White and Sweet Potato Scramble with Fresh Herbs, then I added diced ham, eggs and a few more seasonings before baking it in the oven in my cast iron skillet. Heavenly, doesn’t even begin to describe the amazing taste of this breakfast entree. But I assure you every bite was mouthwatering. I tried to use mostly fresh ingredients and, except for the ham, nothing is processed. So along with tasting great, this recipe is gluten free and definitely on the healthier side. If you need to make the recipe meatless, simply eliminate the ham. Ham and Sweet Potato Hash is so satisfying and one of the best comfort foods for breakfast you’ll ever eat. For that matter, this is a great recipe when you want to serve breakfast for dinner! I was really hungry for a hash dish last month but I’m not a big fan of Corned Beef Hash. 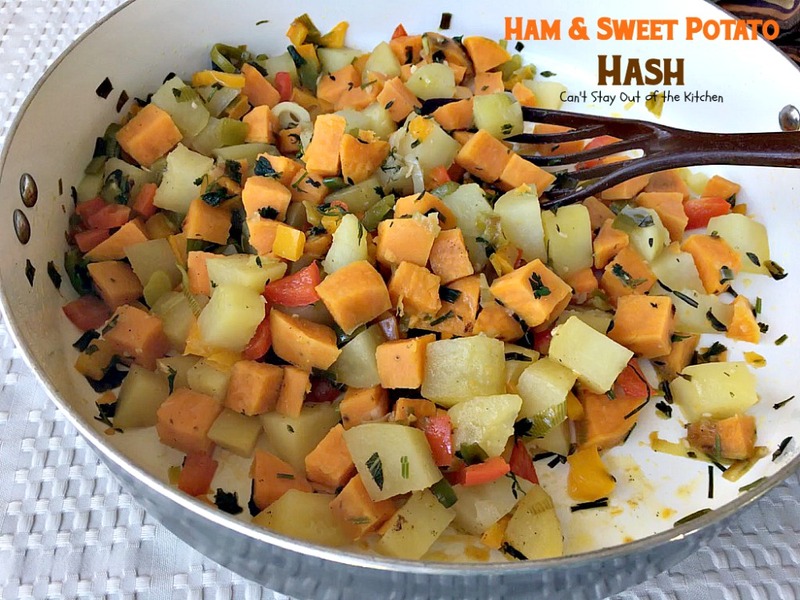 I loved the idea of making hash with both white and sweet potatoes. I also wanted the dish to be well seasoned with herbs but not spicy hot. The fact that this one has onions, leeks, garlic and bell peppers provides even more flavor. 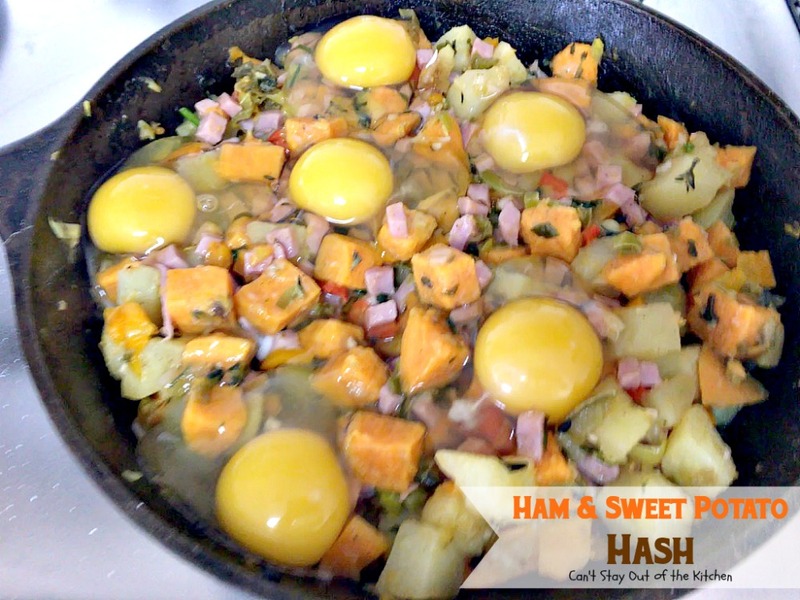 I thought the combination of ham and sweet potatoes would make an excellent hash dish and it sure was. 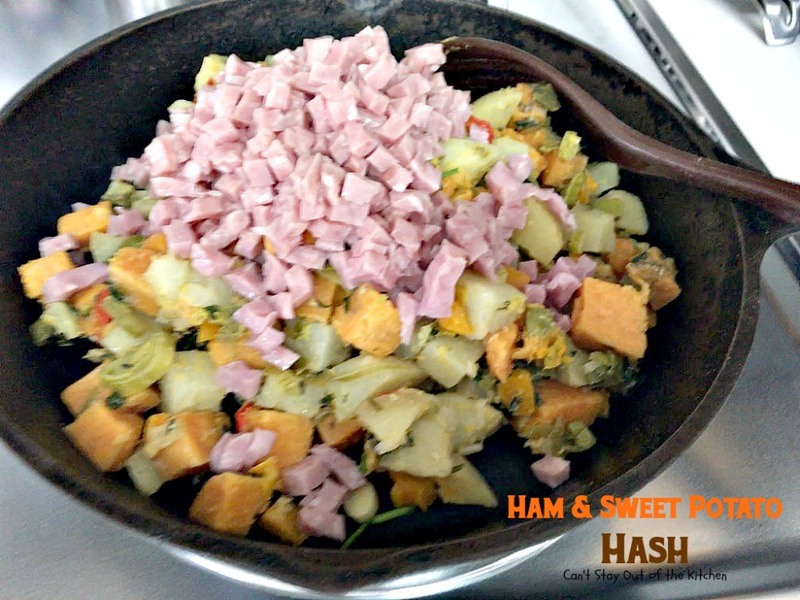 If you’re looking for a fantastic breakfast entree for Saturday or Sunday breakfasts or even a holiday breakfast, I can highly recommend Ham and Sweet Potato Hash. It is absolutely delectable. Ham and Sweet Potato Hash is a fabulous holiday breakfast. All the herbs and veggies in this dish provide incredible flavor and texture in this tasty entree. If you want a hearty, filling and satisfying breakfast, I can’t recommend Ham and Sweet Potato Hash enough. I used these ingredients. The jar with the blue lid contains coconut oil. If you want detailed pictures for preparing the first part of this recipe, check out my White and Sweet Potato Scramble with Fresh Herbs. Saute leeks and green onions in coconut oil in a skillet for a few minutes. Add bell peppers and saute a few minutes longer. 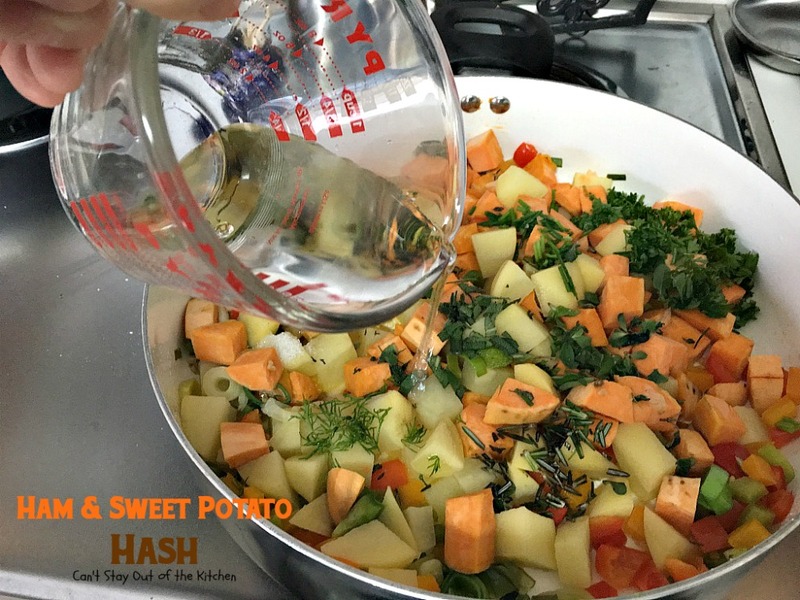 Add potatoes, garlic and sweet potatoes and, if necessary, add a little water to prevent the mixture from sticking. Add spices and fresh herbs. Cover with lid and cook about 25-30 minutes or until sweet potatoes are tender. 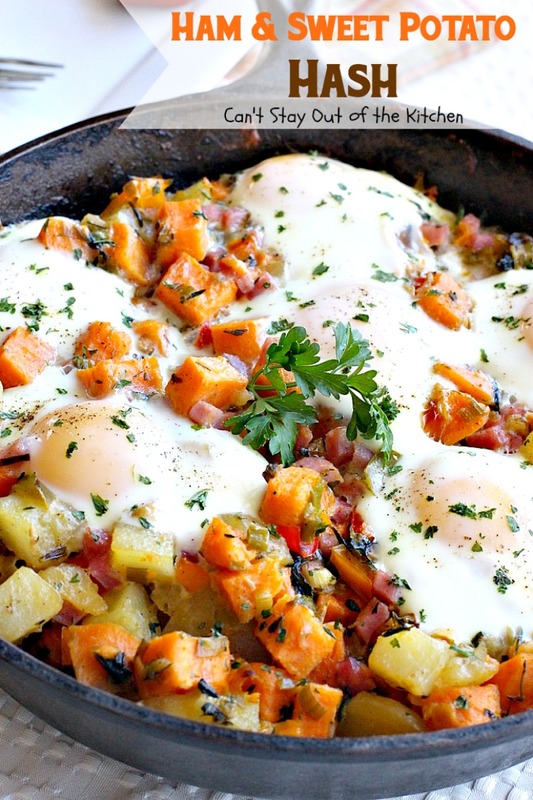 (Here I’ve transferred everything to a cast iron skillet – any ovenproof skillet will work). Add ham. Crack eggs over top of hash. Season eggs with salt, pepper and additional parsley. 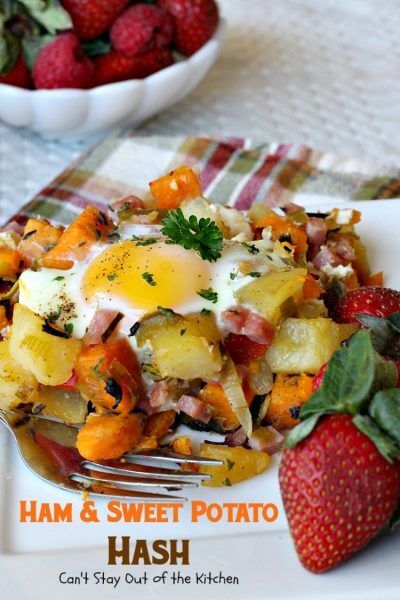 Place skillet in a preheated 350 oven and bake until eggs are set about 10 minutes. (You’re oven may take longer). Serve Ham and Sweet Potato Hash garnished with more parsley, if desired. 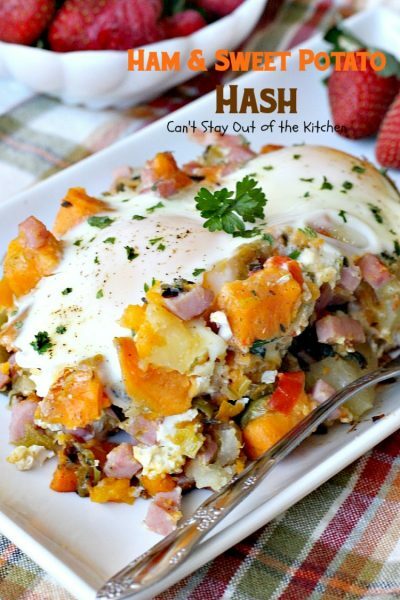 If you enjoy hash, you’ll love this recipe with two kinds of potatoes, ham and eggs. 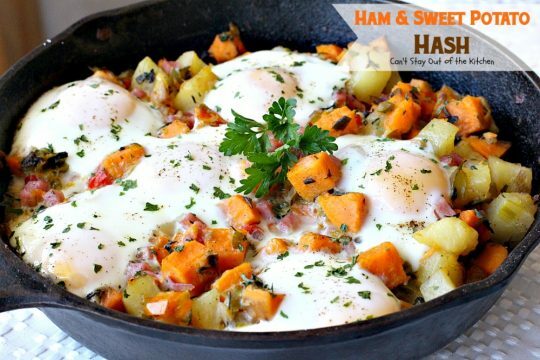 Every bite of Ham and Sweet Potato Hash will have you drooling. 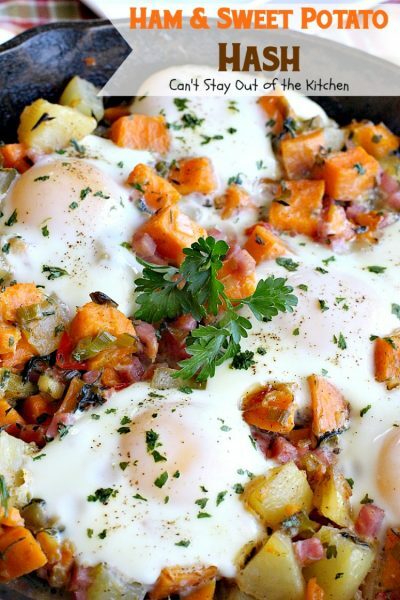 This delicious breakfast dish is made with a sweet potato hash that's filled with veggies and fresh herbs. 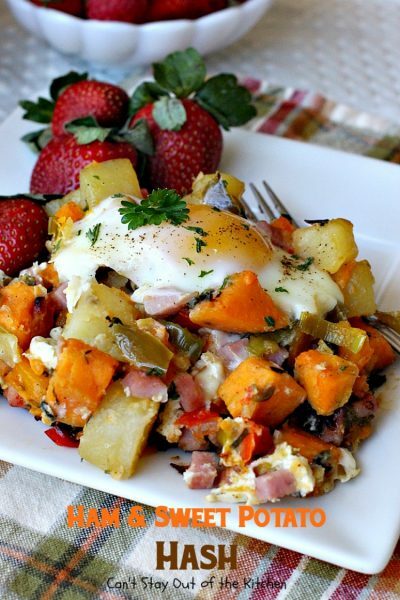 The addition of ham and eggs makes it an unbelievably delicious breakfast that's great for company or holidays! Melt coconut oil over low to medium heat in large cast iron skillet. Add leek and green onions and sauté for a couple of minutes. Sauté a minute or two. 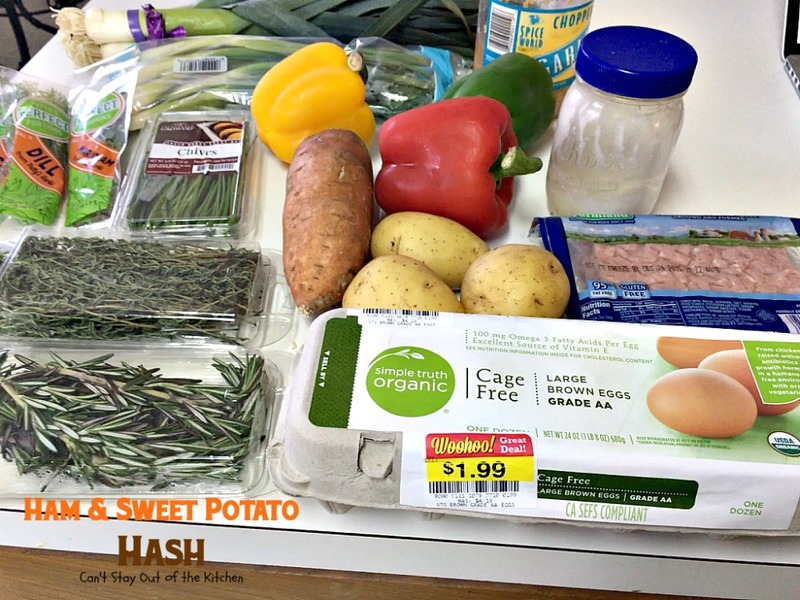 Add sweet potatoes, potatoes, and garlic. Sauté about 5 minutes, adding water if necessary to prevent sticking. Add thyme, dill, rosemary, parsley, chives, marjoram, sage, salt and pepper. Cover skillet making sure there is a little bit of water in the bottom of the pan so veggies don’t stick. Simmer over low heat until potatoes are cooked completely through, stirring occasionally. This may take 20-30 minutes or so. Season with additional salt, pepper and parsley. Bake at 350° about 5-10 minutes or until eggs are set. NOTE: While you can cook the eggs on top of the stove, the only way to get the whites to cook is to cover with a lid. Unfortunately, that causes the egg yolks to overcook. I recommend putting the skillet in an oven instead. While you can cook the eggs on top of the stove, the only way to get the whites to cook is to cover with a lid. Unfortunately, that causes the egg yolks to overcook. I recommend putting the skillet in an oven instead. Adding fresh thyme, rosemary, sage, dill, marjoram, parsley, garlic and chives provide mouthwatering flavor. 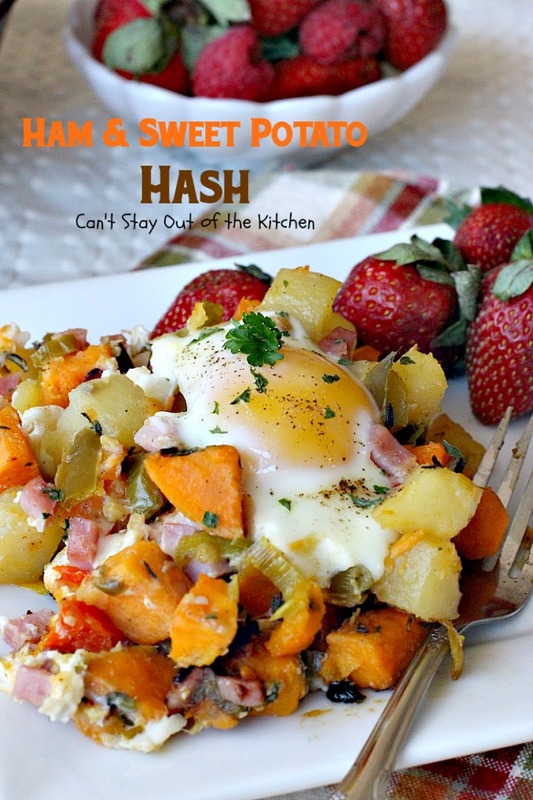 I absolutely loved Ham and Sweet Potato Hash. I think you will too. 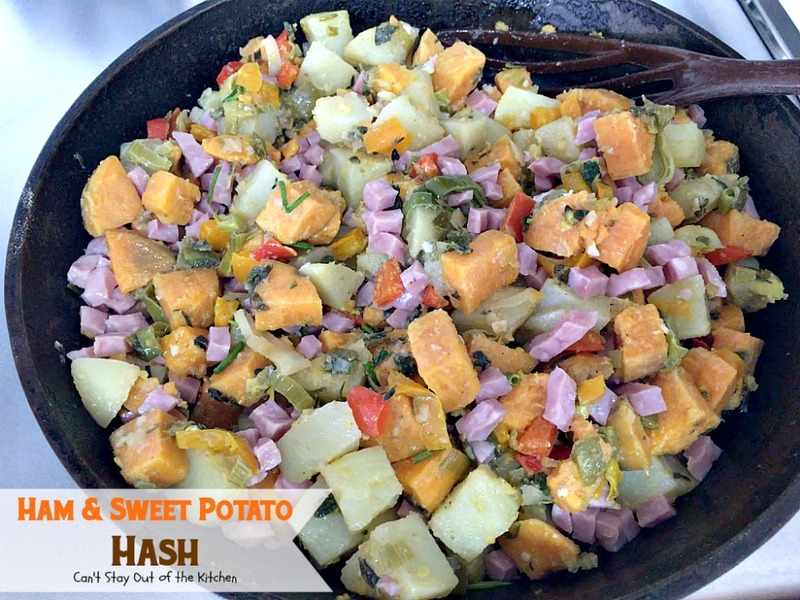 Ham and Sweet Potato Hash is a healthier entree with lots of fresh veggies and herbs. It’s also gluten free. Thanks Kim. It was so succulent and amazing. One of my new faves.